Feelings: The gentrification of many New York neighborhoods has kicked many locals out of the city, and for those who can barely afford to live here, we see a vanishing New York: a giant mall on the island of Manhattan filled with banks, Duane Reade, Starbucks and condos. Sometimes the loss of traditional culture is a good thing--it makes people less prejudiced and opens their culture to others. In the case of New York City, each neighborhood used to represent unique traditional customs and food, but when those started to disappear and replaced by yuppies and hipsters, what do we have left? In the midst of this change, what happened to Nom Wah is a miracle. The oldest dim sum joint in the city was recently renovated while a new owner faithfully preserved the old dining area. His mother must be a Tiger Mom like mine--I would not even question destroying the 90 year old historical space. Respecting the elders, traditions, and history is something I want to cherish in this youth oriented culture we live in now. Since the face-lift, Nom Wah has been a beloved spot for both tourists and foodies alike. When I entered the restaurant, it instantly brought me back to Wong Kar Wai's highly stylized masterful drama, "In the Mood for Love." Although I missed the graceful presence of Tony Leung in perfectly tailored suit, this modest spot will take you back to the mid-century feel without a hint of irony or theme restaurant ambiance. Both Effie and RB mentioned that it was the first time they have seen check patterned tablecloth at an Asian restaurant. "I fully expected to start eating Italian," said RB. Although they serve dim sum, this is not one of those large dining halls with cart service you may see in Chinatown. This is a tea parlor after all. Just like Vegetarian Dim Sum House nearby, you mark your selections with a pencil and give the sheet of paper to them. Except the still frozen-in-the-middle vegetable dumplings ($2.50), almost all the members at the table enjoyed the food and service. 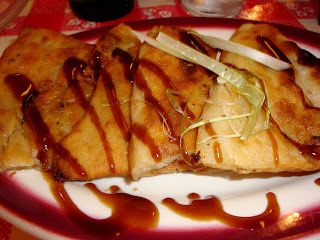 The "Shrimp Sui Mai ($3.50) and scallion pancakes ($3.50) were my favorites. 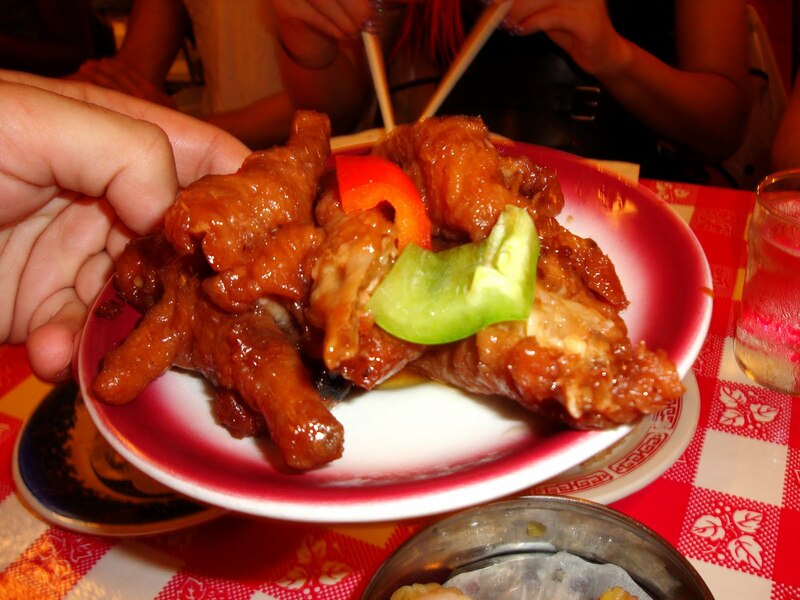 And I actually liked the taste of chicken feet, go figure," JBH said. Our resident tea aficionado SaSha enjoyed the tea selection and said that tea is usually free in restaurants like this, but for the price we got a strong, satisfying pot of oolong that easily served three of us. "Much better than the free tea at most restaurants." The pot of oolong tea unquestionably complimented their famous almond cookie. 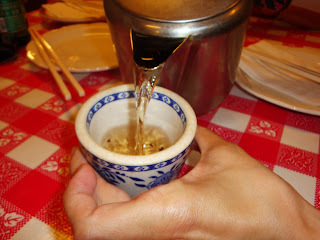 If you are not a big dim sum fan, I'd recommend you to stop by for just the tasty, soft almond cookie and a pot of tea. If there was a Chinatown version of Seinfeld, I could easily envision Jerry and George hanging out here over some tea. 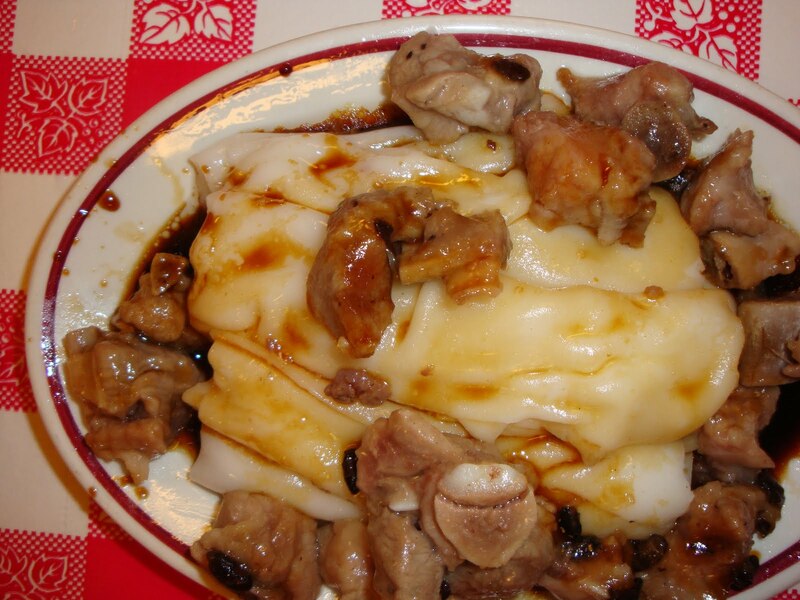 It is a fact that in recent years, the best Chinese food is found in Flushing, not Manhattan Chinatown. 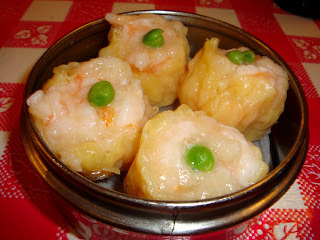 And while my favorite dim sum spot remains Ocean Jewel in Flushing, and as StevenC thought the food at Nom Wah was not the highest of the quality, sometimes it is not just about the food. It is about the dining experience. It is about history. 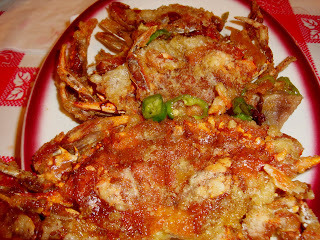 So why not take your future spouse to Nom Wah for your first date? You could someday come back to the same location with your grandchildren and say, "I took your grandmother here on our first date." Be a part of their history--I'm sure the history of Nom Wah will live on. Thank you! -=D It's okay, my daughter can't sit up on her own quite yet, so she'd be in her stroller or on my lap. I love your posts, especially the ones about the japanese junk foods!